I am back to being Top Hand again… just like the old days. The boys have taken a short “break” (more on that in the future – maybe!) and so, I step back in as a pitiful and weak substitute. But I’m all Vernon has, so he makes do. Today he was bound and determined to get some water started on some fields. Remember, here in Wyoming, we get a grand total of 14″ of rain PER YEAR. That means to grow *anything* in a field situation… you’ll need to irrigate it some way or another. Our choice is flood irrigation. 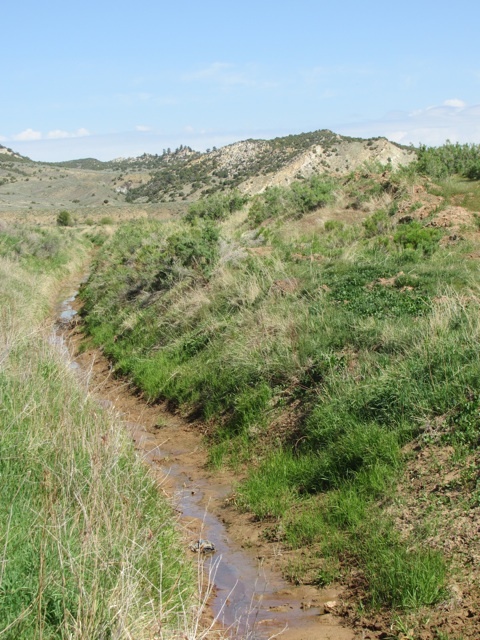 To flood irrigate, you need to take water out of ditches. 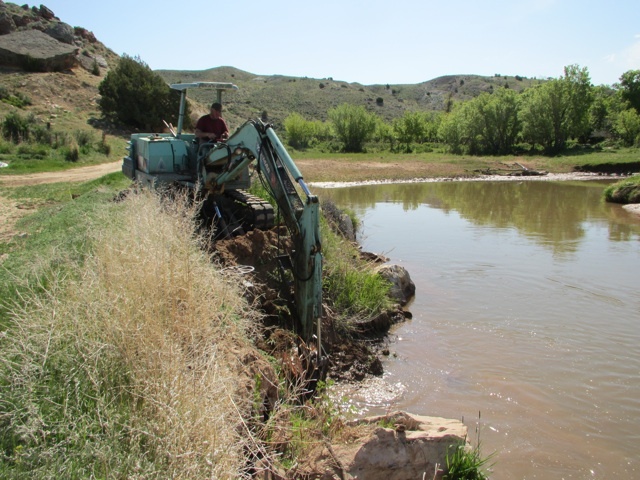 To get water out of ditches, you need a dam in the creek to back up water into your ditch. You also need to clean out your headgate (where the water from the creek is controlled through your ditch). Since you haven’t used your ditches since last fall… when you closed that headgate down… all the silt the creek carries along has been dumped in front of your headgate. Back in the day, you waded in, shovel in hand, and sweated while shoveling mud out of the creek bottom. 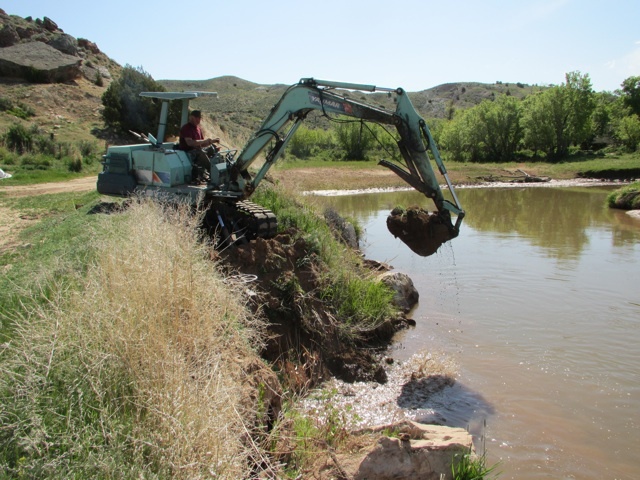 These days, you haul your spiffy little excavator to the creek bank and streeeeetch down to the headgate and clean it out in no time. See the metal wheel to the left of the excavator’s arm? That controls the headgate, and the flow of water into the ditch. Think faucet. How many shovel fulls does one scoop equal? Doesn’t matter! This is just SO much easier! The ditch waits for its “head” of water. May 12, 2008 no entry.